Construction on The Reserve, a 635-unit residential development project in northeast Carlsbad, has just gotten underway. The project is being built at a former rock quarry site covering 156 acres, with more than half of that designated as open space. The retail value of the project, which will offer 293 single-family detached luxury townhomes and 342 luxury apartments when it opens in 2016, will exceed $200 mil. It is a development of. Located west of College Blvd and south of Route 78, The Reserve is intersected by Buena Vista Creek and home to El Salto Falls, which the San Luis Rey Band of the Luiseño Indian tribe considers sacred. 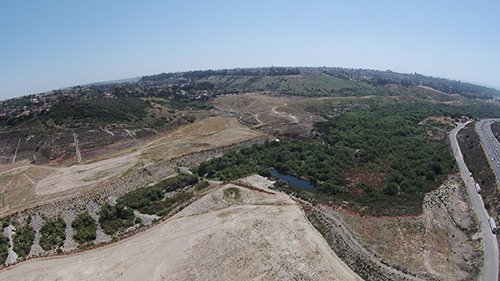 The San Luis Rey band plans to build a tribal resource center at the eastern edge of the falls, and a Native American monitor has been on site during grading to look for artifacts that might be uncovered. So far, the grading has unearthed several ice-age fossils, including Columbian Mammoth and prehistoric bison parts that have been given to the San Diego Natural History Museum. The Reserve will offer a diverse array of housing options, from attached townhomes to single-family detached homes to multifamily units. All homes are to feature a private fenced yard. With more than half of the community designated as open space, The Reserve includes abundant natural features and trails that integrate into the city trail system. The community will provide a critical piece of the planned Waterfall to the Waves Trail, which spans almost three miles from the waterfall to the coast. The site is adjacent to the Buena Vista Creek Ecological Reserve and is surrounded by open space. In addition, the coastal Buena Vista lagoon is two miles away. At the north end of the community overlooking the valley is the historic Marron Adobe, built in 1839 and one of the oldest structures in Southern California. Cornerstone is making use of this important resource to get area schoolchildren involved in the community. For example, students who visit the hacienda will be able to paint tiles that will be incorporated throughout the community and enter contests to name some of its streets. The site is close to shopping, restaurants, hospitals, schools and freeways and encompasses several parks and playgrounds, pet play areas and trail connections. The project is Cornerstone Communities’ fourth joint venture with Presidio. In California, the companies are also developing Pacific Ridge (317 units) in Oceanside, Tuscany Village (212 units) in Bakersfield and Otay Ranch Village II (225 units) in Chula Vista.